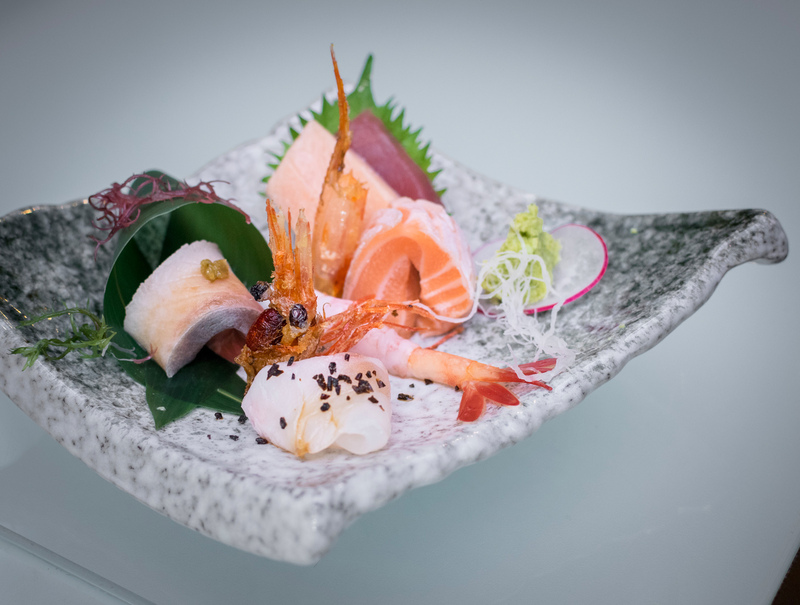 Japanese fusion restaurant Maru at Icon Village — popular for it’s value-for-money and delicious donburi bowls amongst the CBD lunch crowd — introduces Chef’s Table, an omakase-style dinner experience. We had the opportunity to sample their 8-course set ($78++), and were very pleased with its quality. First course of the newly introduced Chef’s Table at Maru Dine & Bar – 3 Kinds Of Appetizer. 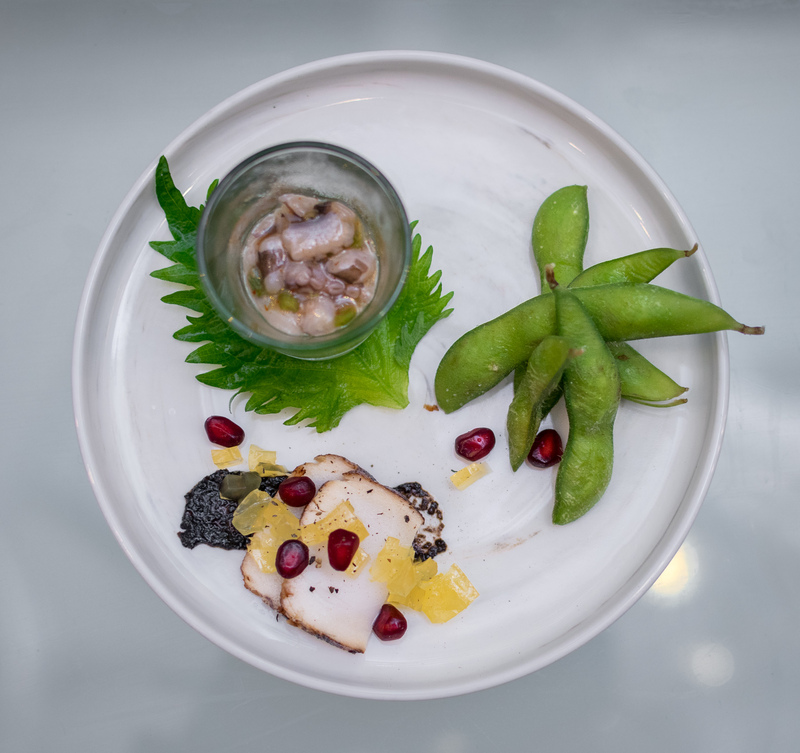 We enjoyed the modern touches such as mango gel and pomegranate seeds paired with a white tuna tataki. 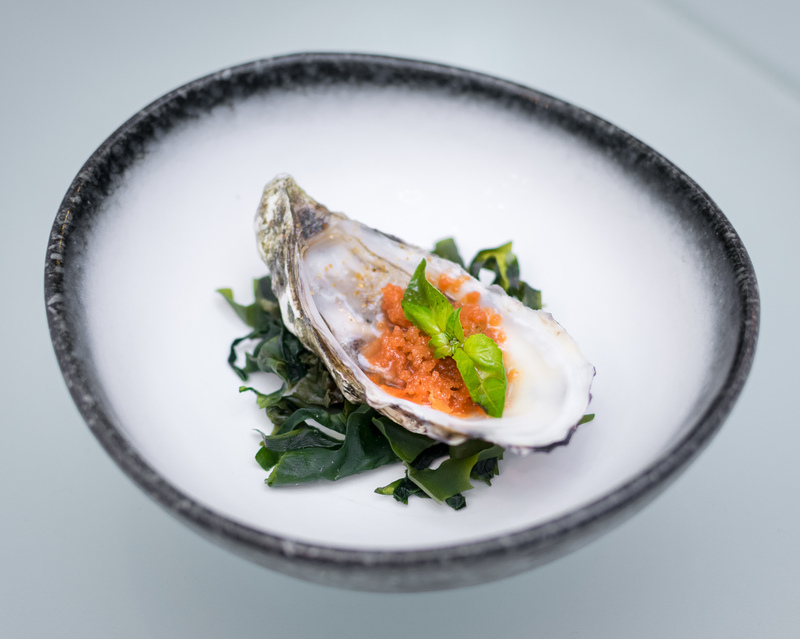 The Fresh Oyster w/ Smoked Tomato Sorbet is an inspired combination of tangy smoked tomato sorbet and creamy, briny oyster. The smokiness came through with an understated assertiveness that I found quite pleasing. The sashimi platter is what I look forward to most in any omakase, and Maru’s 5 Kinds Of Assorted Sashimi definitely has my stamp of approval. Clever little touches abound, such as the spicy zestiness of yuzu kosho salt playing off buttery yellowtail, sweet and salty shio kombu garnished snapper, and a deep-fried crispy prawn head sitting alongside its decapitated body. 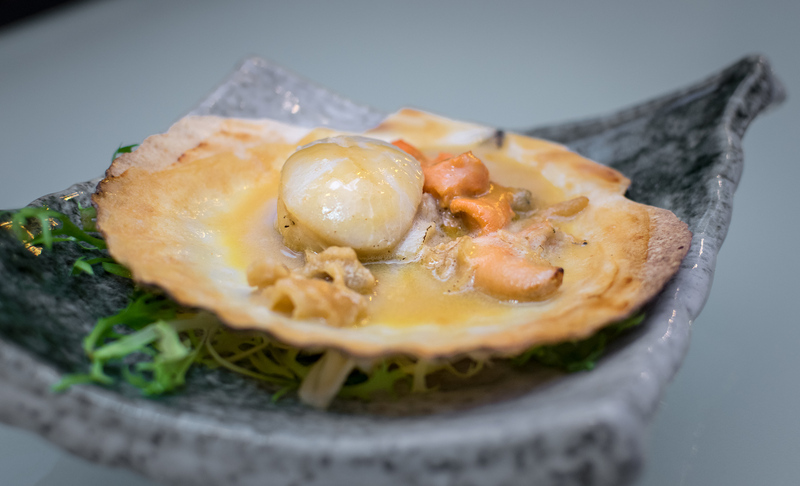 I expected the Grilled Seasonal Item portion of the omakase to be of the fish variety, and was pleasantly surprised by the large scallop in a half shell presented before us. Sitting in a richly unami miso uni sauce, I was happy they served the scallop with its roe, a delicious part of the shellfish that’s all too often left out or even viewed as undesirable. Unfortunately the scallop itself was slightly overcooked. Next up were 2 Kinds Of Raw Sushi. Our eyes lit up at the sight these pimped up nigiris. 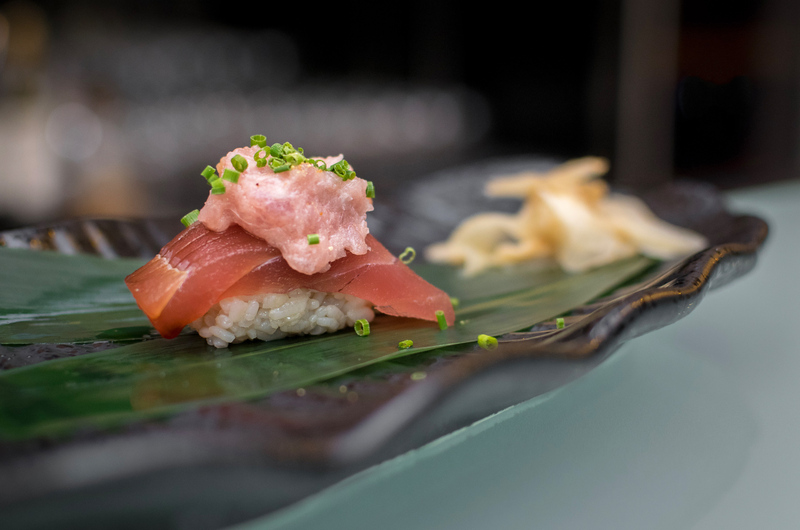 The Tuna Belly Sushi – chopped otoro atop maguro was a luxe single bite that I wanted more of. 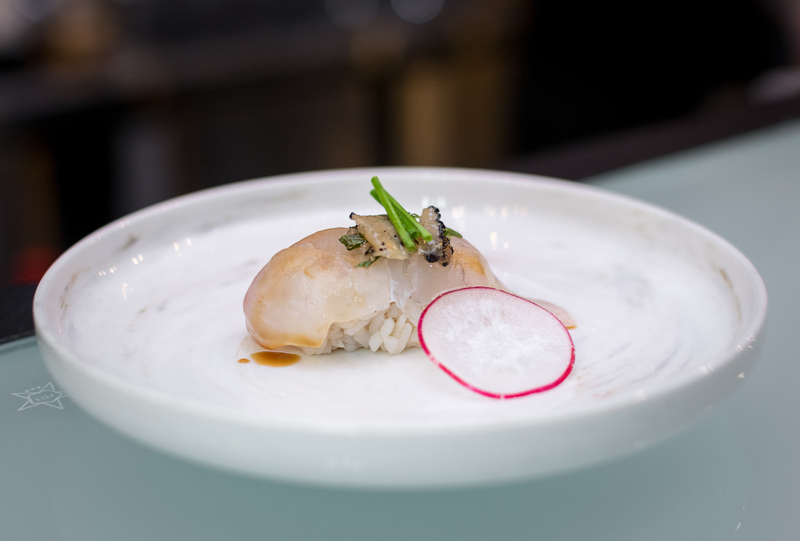 The Truffle Snapper Sushi draped with a single sliver of shaved black truffle and miniature batons of chive surprised in every category, its exquisite balance of flavours and aromas a festival for the senses. Some men just want to watch the world burn, other men just want to watch sushi burn. 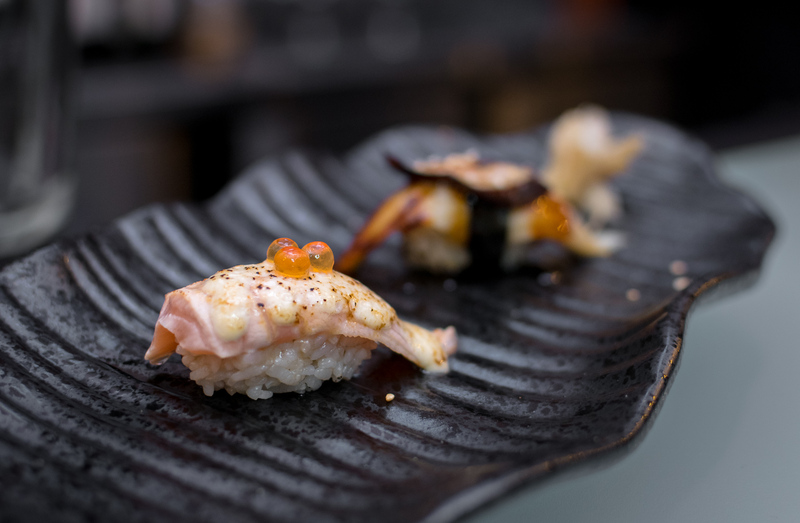 Tantalising us with their alluring aroma even before they hit the table, the decadent duo of aburi salmon belly slathered in garlicky mayo and foie gras-bound aburi anago melted in our mouths like fat in the frying pan, a guilty pleasure I’d like a repeat performance of. 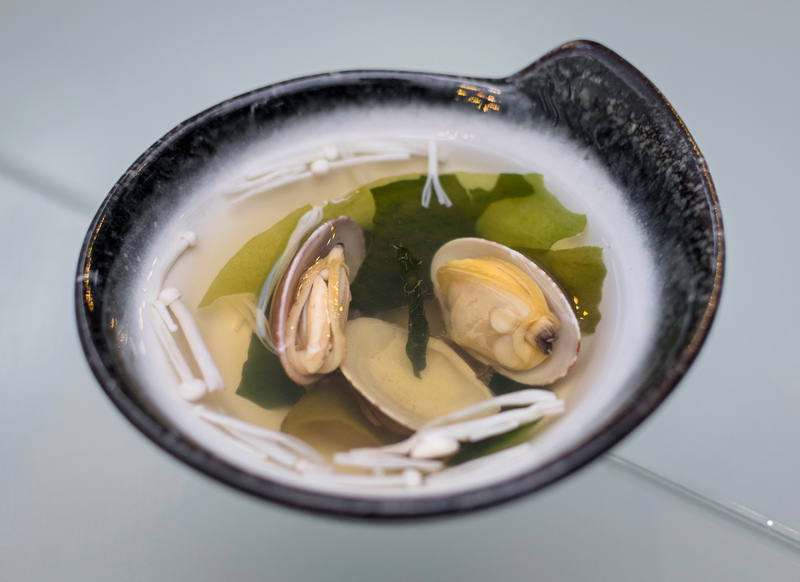 Closing off the savoury portion of the meal was the Soup of the Day, a light clam and kombu broth with hon shimeiji mushrooms. 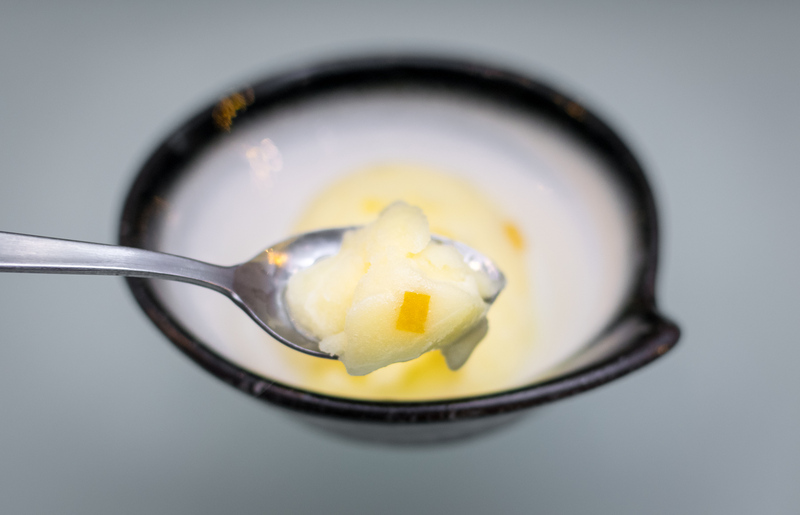 Finally, cleanse your palate with a refreshingly citrus-y Yuzu Sorbet. I’ve tasted alot of bad ones which were reminiscent of Mama Lemon, but this was perfectly balanced and even had bits of candied yuzu in it. Oishii! Till 30th April 2018, enjoy Maru’s 8-course Chef’s Table experience 1-for-1 at $78++.